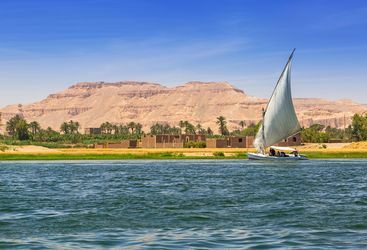 A luxury Nile cruise boat, the Oberoi Philae can be found plying the waters of the Nile between Aswan and Luxor on four or six night cruise itineraries. The twenty two cabins and suites on board are spacious and contemporary in design, featuring plush furnishings and king sized beds. All rooms have large windows and French doors which open out onto decks, where expansive river views can be enjoyed. For added indulgence opt for one of the Luxury Suites with Terrace, which benefits from a private terrace with a heated whirlpool. The dining experience on board Oberoi Philae begins with a full breakfast in the dining room, followed by a light lunch or barbeque at the Poolside Restaurant, where guests can enjoy the sunshine and river views as they dine. As darkness falls, dinner will be served back in the dining room and consist of a varied selection of the finest Western, Asian and Middle Eastern cuisine. After dinner, retire to the lounge for a drink or two, or head back to the deck to do a spot of star gazing. While cruising down the Nile guests will want to take full advantage of the large outdoor swimming pool on the sun deck, the perfect spot to cool off and enjoy the views. Of course the main activities are enjoyed off board. During the daily guided excursions guests will visit Aswan's High Dam and Philae temple, the Temple of Edfu, the valley of kings, Nubian Museum and various other historic and incredibly impressive Egyptian monuments. After a busy day or so of exploring, perhaps head to the spa for a massage or other rejuvenating treatment. Combine a relaxing river cruise with a wealth of fascinating ancient history for the ultimate culture chill-out combo. Amelia is our 'The Oberoi Philae' expert and as a seasoned traveller has the inside track on the most memorable adventures.